Racine & Associates is a business, public pension, real estate and commercial litigation firm. We have the experience to efficiently handle complex as well as common legal matters faced by any organization. Racine & Associates is known and respected for effective representation and dedication to clients. We look forward to serving you. We regularly advise business owners with regard to the establishment of framework necessary for organizations to operate in compliance with applicable laws and regulations. We are well equipped to handle your most basic and complicated business law needs. 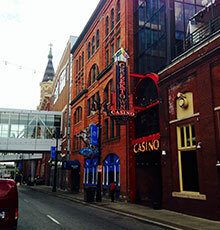 The firm serves as general counsel and advisor to numerous Metropolitan Detroit area businesses, assisting with business organization, acquisitions, financing matters, day-to-day issues, and administration. 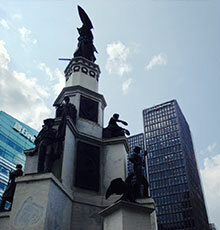 Racine & Associates proudly serves as special legal counsel to three of the largest public pension systems in the State of Michigan: Police & Fire Retirement System of the City of Detroit, Wayne County Employees’ Retirement System and the General Retirement System of the City of Detroit. We take pride in assisting each client with pro-active measures to avoid litigation and many times find that the most effective measures are pre-emptive. However, sometimes litigation is the necessary route. That’s when we will provide you with an aggressive, yet practical strategy to pursue your goals. Since 1985, Racine & Associates has handled real estate development and financing matters as a primary part of its practice, serving as special legal counsel to public pension systems, area developers and a national mortgage company. 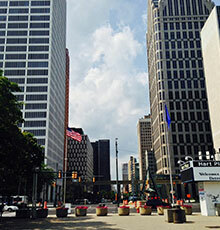 Our firm is conveniently located at the northwest corner of Campus Martius Park in Downtown Detroit at the intersection of Woodward and Michigan Avenues in the 1001 Woodward Building. 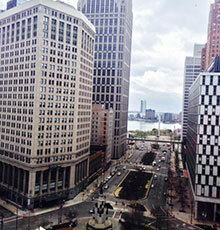 Parking is available in the 1001 Woodward Parking Garage attached to the north side of our building. The entrance is on State Street.